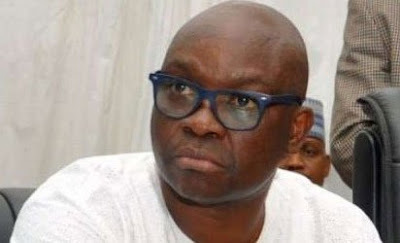 Gov Fayose declares Friday work free in Ekiti – Royal Times of Nigeria. Ekiti State Governor Ayo Fayose of has declared May 19th, work free day in the state in honour of the late former Military Governor of the old Western region, retired Maj. Gen. Adeyinka Adebayo. Fayose announced this in Ado-Ekiti yesterday during a meeting with members and executives of the National Association of Proprietors of Private Schools (NAPPS). The governor said that nothing would be too big to honour the late Adebayo, having paid his dues and contributed immensely to the growth and development of Yorubaland. He said; “The work free day does not, however, affect the banks in the state,”. According to him, the body of the deceased will lie-in-state at the Oluyemi Kayode Stadium, Ado-Ekiti on Friday before interment on Saturday in Iyin-Ekiti.